The children were curious to know what we had brought. Did you know that your weekly mission offerings and world budget offerings help support more than 455 missionary families, such as Tyler’s, around the world? Thank you! Growing up as missionary kids, it’s sometimes easy to forget that we actually live in the mission field. Life here seems normal to us, just like life seems normal to you, wherever you live. Last December our family decided to launch a small mission project in an area not far from where we live in Bangkok, Thailand. We have been helping a church planter who is working very hard to start a church in this neighborhood. About 100 families live in small shacks made of wood and tin, crowded together along the banks of a dirty canal. Our plan was to make 100 bags of Christmas cookies that we could give to these families. We thought that it would make them smile, and maybe it would give us an opportunity to tell them what Christmas is about. So we chose a day to make the cookies. We worked all day long and baked about 400 sugar cookies! Talk about a lot of rolling, cutting, and baking! We made a variety of large and small cookies, cutting them into star, Christmas tree, and gingerbread man shapes. When we lived in another country, before we moved to Thailand, our mom would make lots of sugar cookies. Then she would invite our friends and the student missionaries to come over to our house for cookie-decorating contests. Everyone always had fun decorating the cookies with different colors of icing. She would prepare the icing ahead of time and put it small plastic bags. We thought the people in the canal neighborhood would enjoy decorating cookies too. So we made up bags with one large decorated cookie as an example. Then we added two or three small plain cookies and several small plastic bags of different colored icing. All the kids would need to do is snip off a small corner of the bag to have fun decorating their own cookies! When we tied the last bow on the final bag, we heaved a sigh of relief and went to bed. On Sabbath we took them to the church plant. When we carried the baskets of cookie bags inside, the small group of Bible students and children were curious to know what we brought. But we waited until after church to show them. When church and potluck were finally over, we brought out the cookie bags. You should have seen the smiles—even on the adults’ faces! One of them, a grandma who is probably in her 50s, got so excited that she immediately put on her shoes and took us around the neighborhood, giving the cookies to the neighbors for us! She was so happy to have something nice to share with her friends and neighbors. We visited a lot of people that day. Some of them were sick, which gave us an opportunity to sing and pray for them. Even though it was a lot of hard work to make all the cookies and put them into the bags, it was worth the effort. We don’t know whether anyone will learn to love Jesus because of our cookies, but at least they will know that Christians care about them! 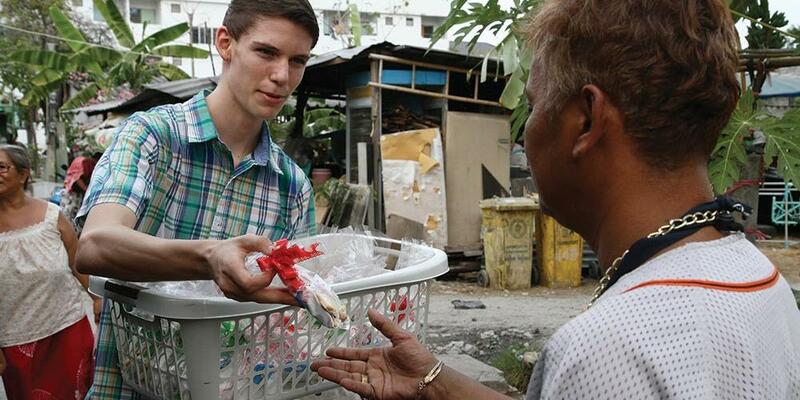 Tyler Whitsett, 16, moved to Southeast Asia when he was only three years old. He enjoys playing guitar, making homemade pasta, and producing videos. His younger brother Ryan is 13.